The following post originally appeared on the Russian-language blog of the author, Askai707. There are three installments to this investigation: Part One, here (EN) and here (РУ), this post, and the final part, “Hero of Russia,” here (EN) and here (РУ). 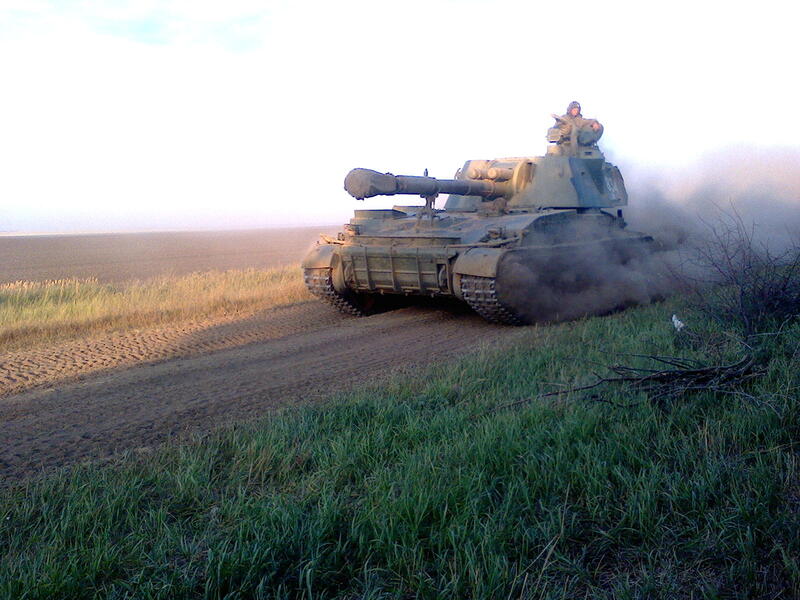 Below is an English translation of the post (translated by Aric Toler), which concerns the open source evidence proving the participation of Russia’s 200th Separate Motorized Infantry Brigade (military unit 08274) in the Ukrainian conflict during the summer and autumn of 2014. 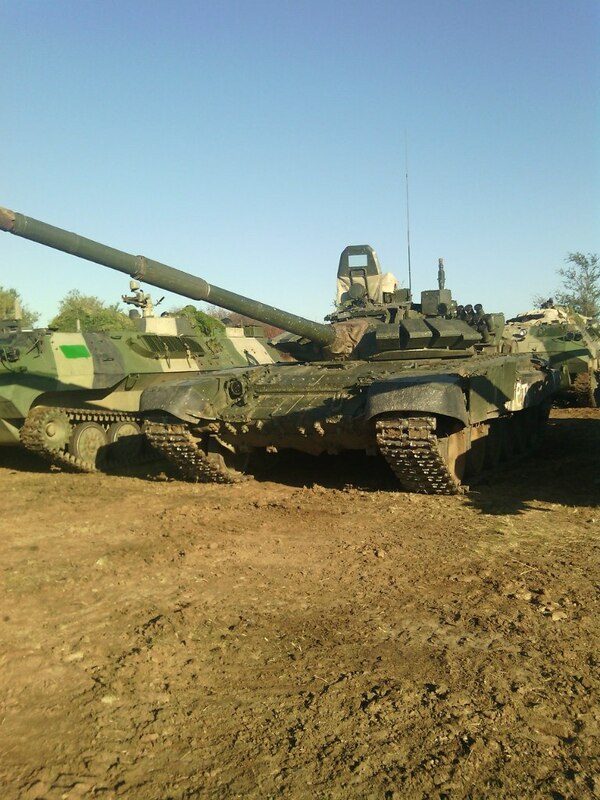 This post focuses on the military equipment of the 200th Brigade that was photographed and filmed in the Luhansk Oblast of Ukraine, and later returned to its base in the Murmansk Oblast of Russia. 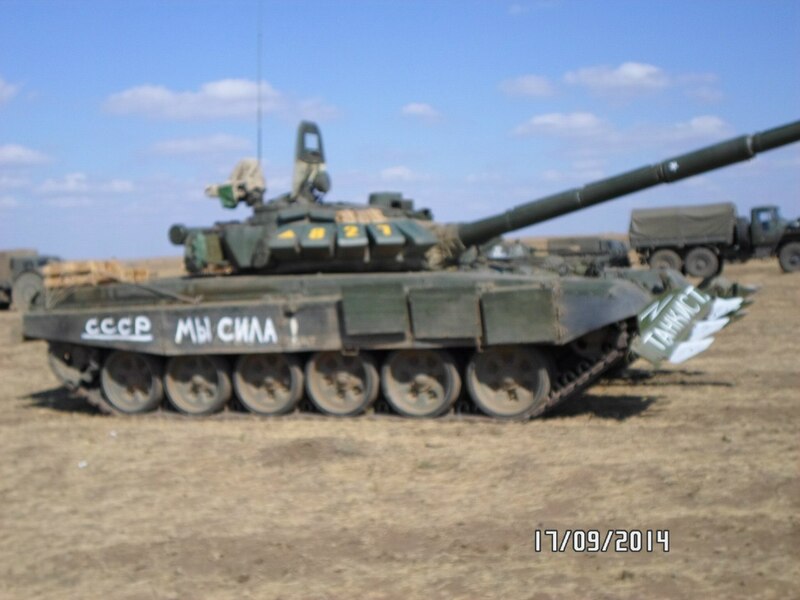 This evidence is examined by means of indirect indicators, such as similar tactical marks and slogans, and very direct indicators, such as identical tanks being photographed in the war zone and back on base in Russia months later. 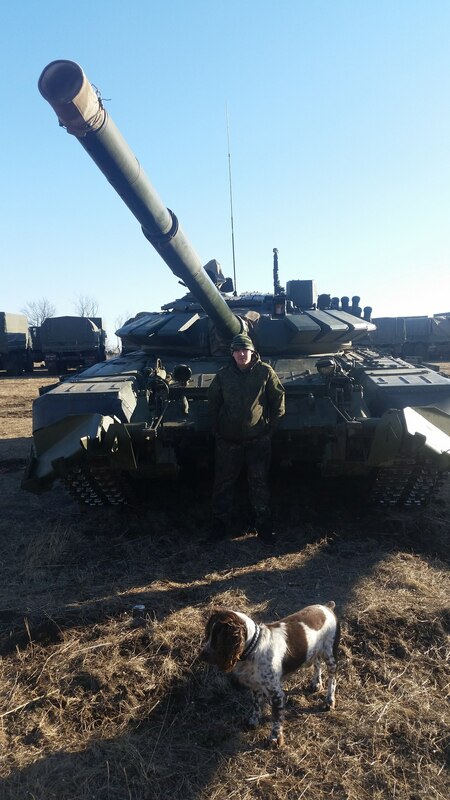 This post of the three-part series on Russia’s 200th Separate Motorized Infantry Brigade, military unit 08275, will focus on participation of the brigade’s division in the war in the Donbass. 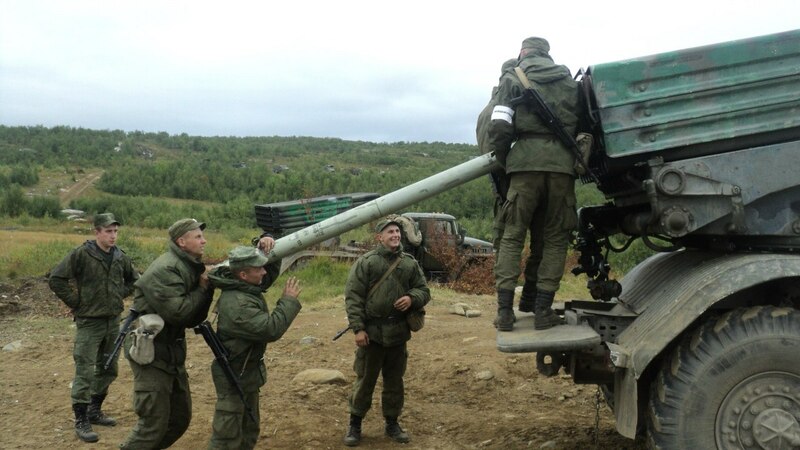 The 200th Separate Motorized Infantry Brigade, hereafter referred to as either the 200th Motorized Infantry Brigade or just the 200th Brigade, is based in the villages of Pechenga and Luostari, in Russia’s Murmansk Oblast. 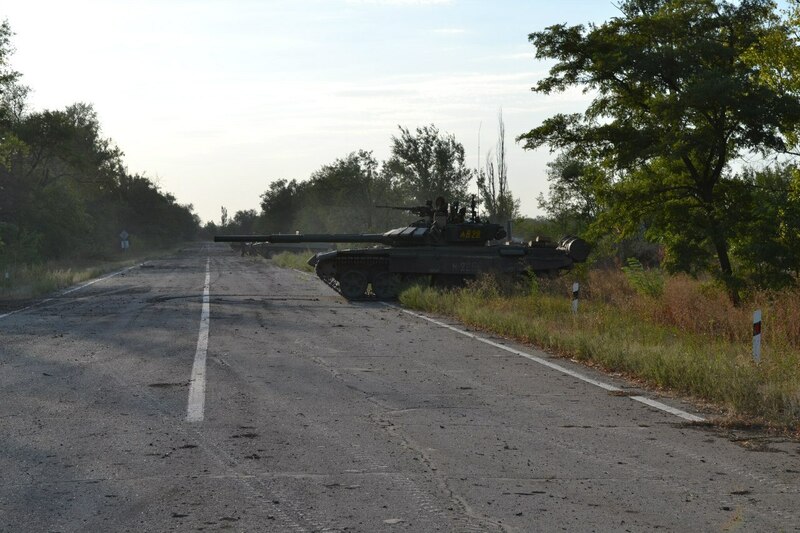 This post will detail the indirect evidence surrounding the brigade’s participation in the conflict in the Donbass, complementing the direct evidence found in Part 1 (EN / РУ). Before the indirect evidence is presented, it is necessary to mention that I have discovered new direct evidence since the first post of this series. 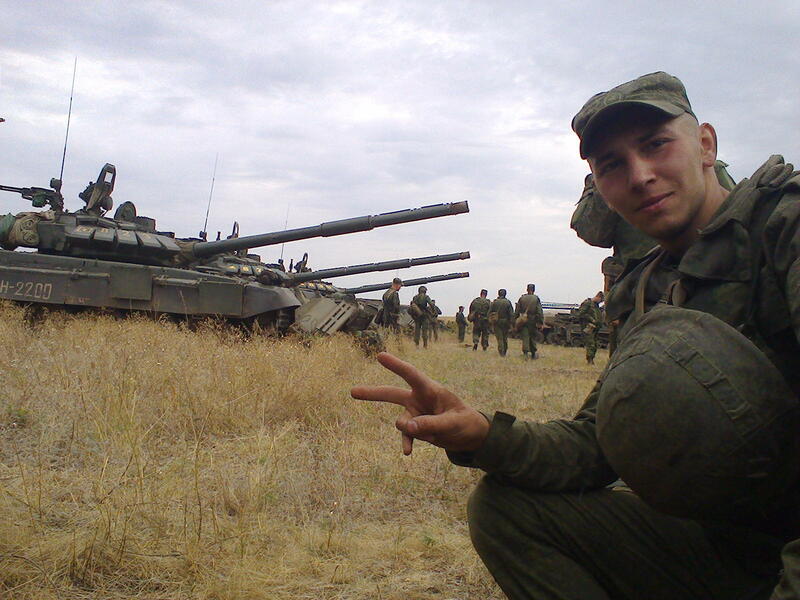 We can now say where a photograph uploaded onto the account of the Russian serviceman Sergey Kalashnikov of Russian armored vehicles of the 200th Motorized Infantry Brigade was taken. 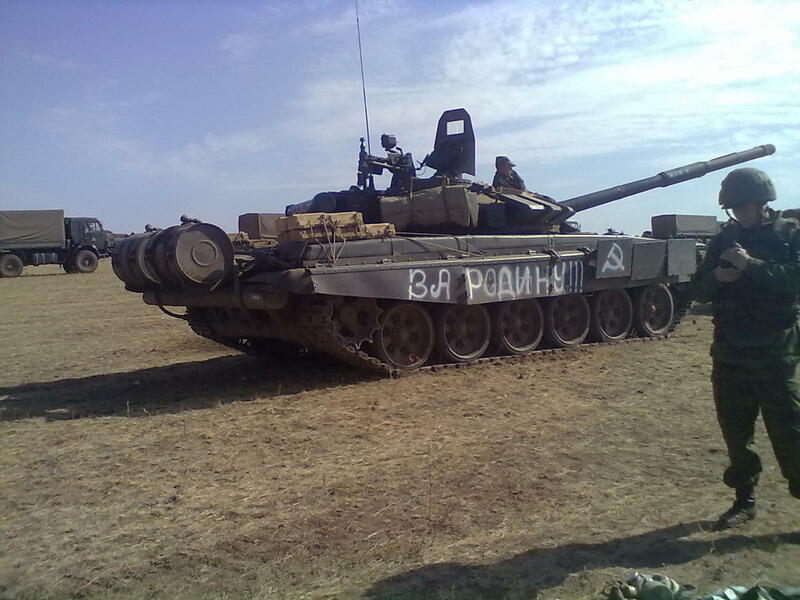 With the help of “Yandex Panoramas,” we can establish that the T-72B3 tank with the yellow hull number “828” and signifying triangles of the 200th Brigade, along with the other armored vehicles behind it, was photographed on a road 600 meters from the destroyed terminal of the Luhansk Airport. 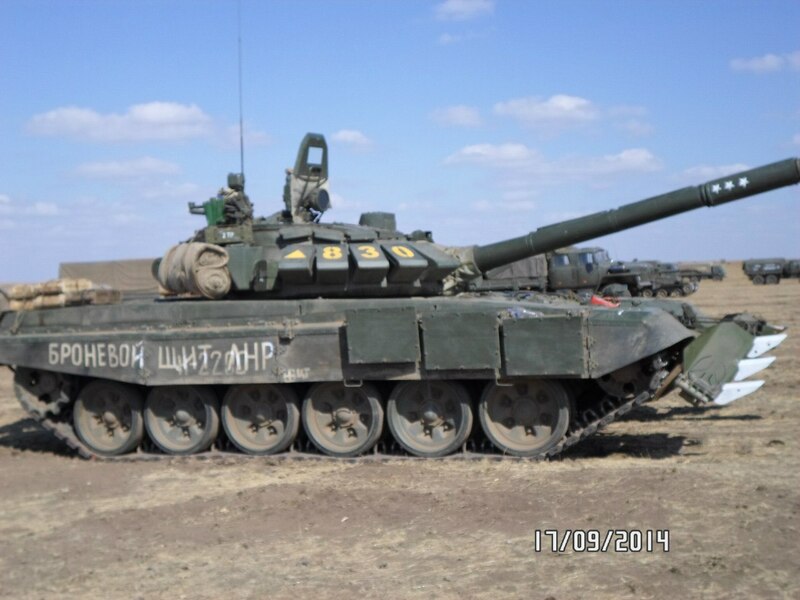 In addition, in the VKontakte (VK) group “‘Tisk’ National Information Portal,” there was a note published with a video on which we can see a Russian T-72B3 tank together with militants’ tanks near the Luhansk Airport during a battle. This video was previously published on the Odnoklassniki accounts of Dmitry Pomnikov and Aleksandr Oviychuk, militants for the Amur Battalion, of the self-proclaimed Luhansk People’s Republic (LNR). There are two archived pages that show the video, here and here. 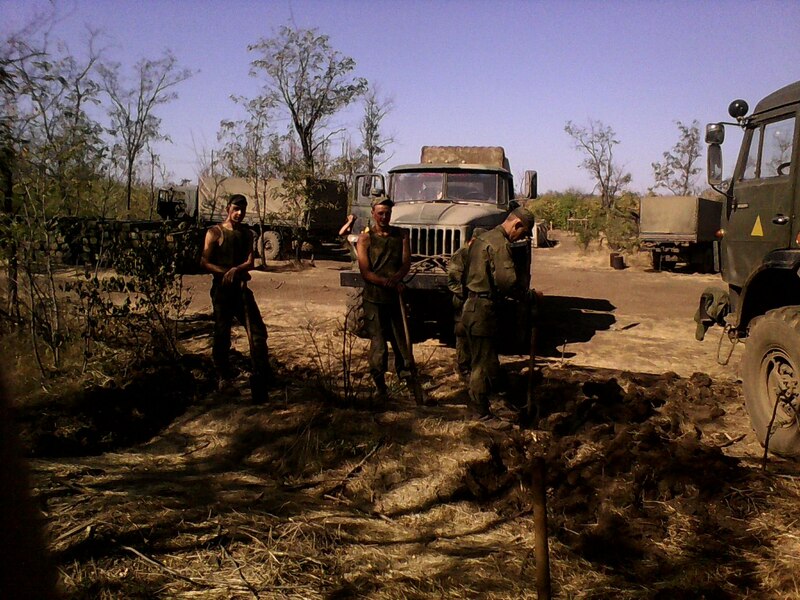 Comparison of a video showing the 200th Brigade near Luhansk, and Yandex Maps, with a row of three trees as a reference point. 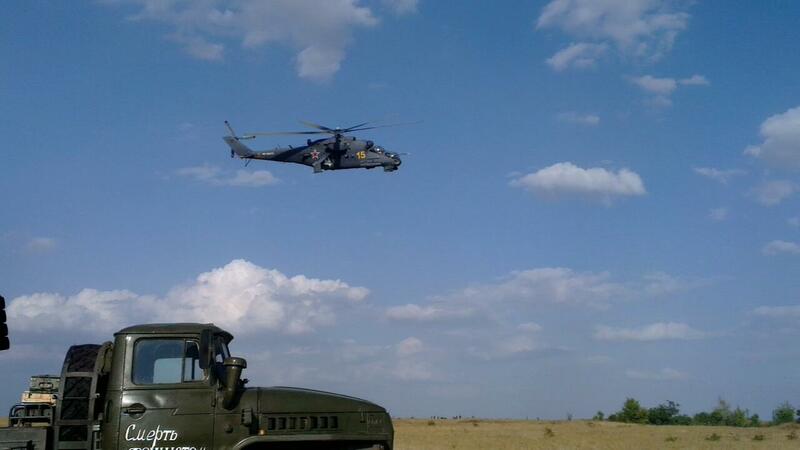 The same line of trees, visible in the video of the 200th Brigade at the Luhansk Airport, looking northeast. 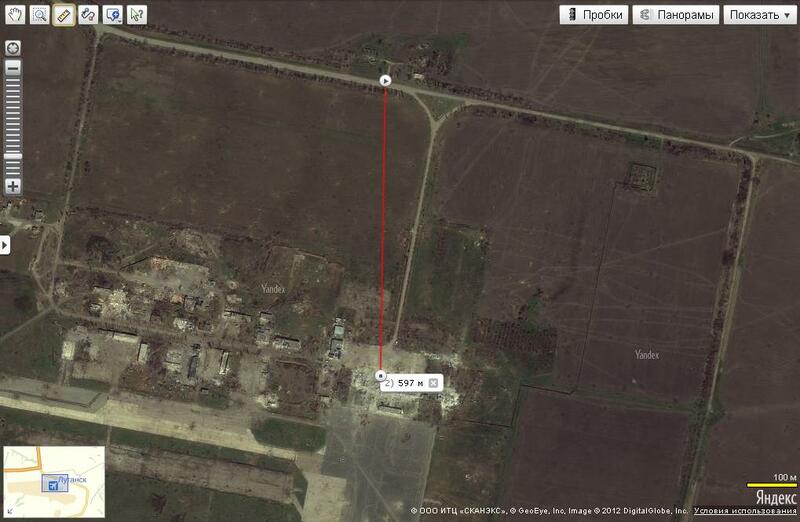 Located at 48°25’27.3″N 39°22’48.8″E. 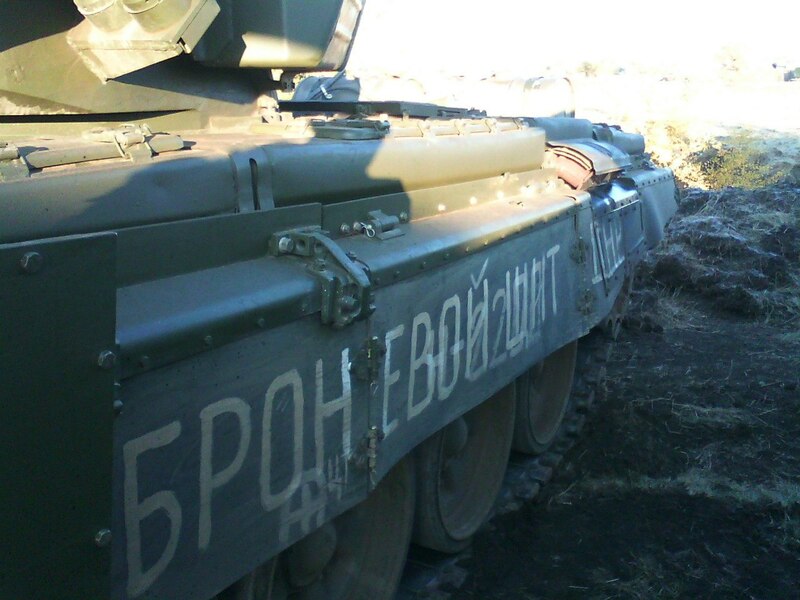 On the side of the T-72B3 tank from the video, we can see H2200 handwritten in large, white painted letters. 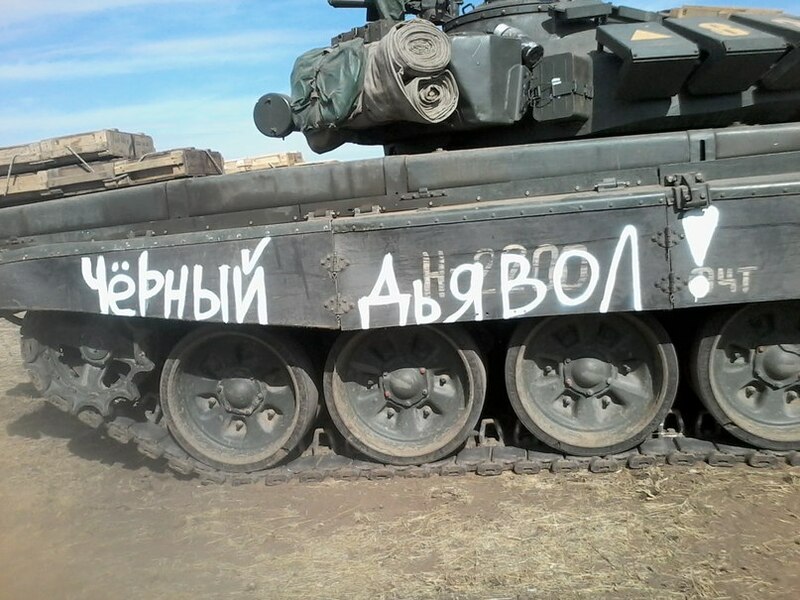 Such inscriptions of “H2200” are left over after transport on Russian railways, and this code can be seen on many tanks of the 200th Motorized Infantry Brigade. 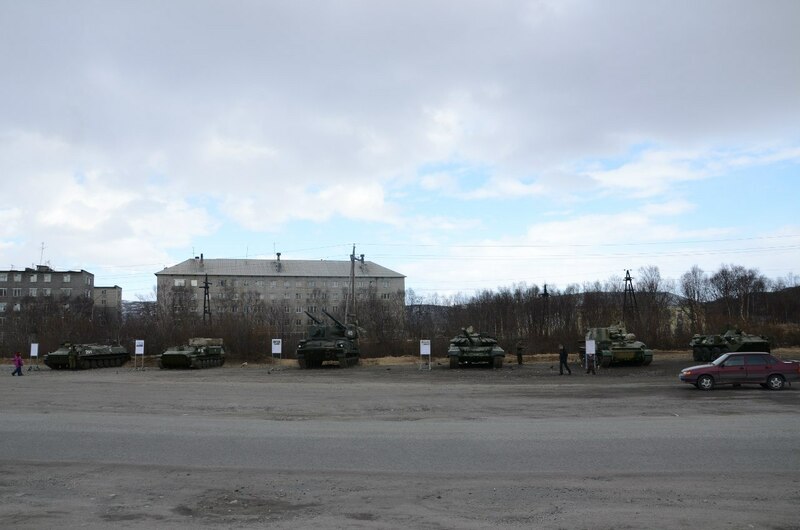 Four photographs of tanks from Russia’s 200th Motorized Infantry Brigade with the H2200 oversized cargo railway code on the side. 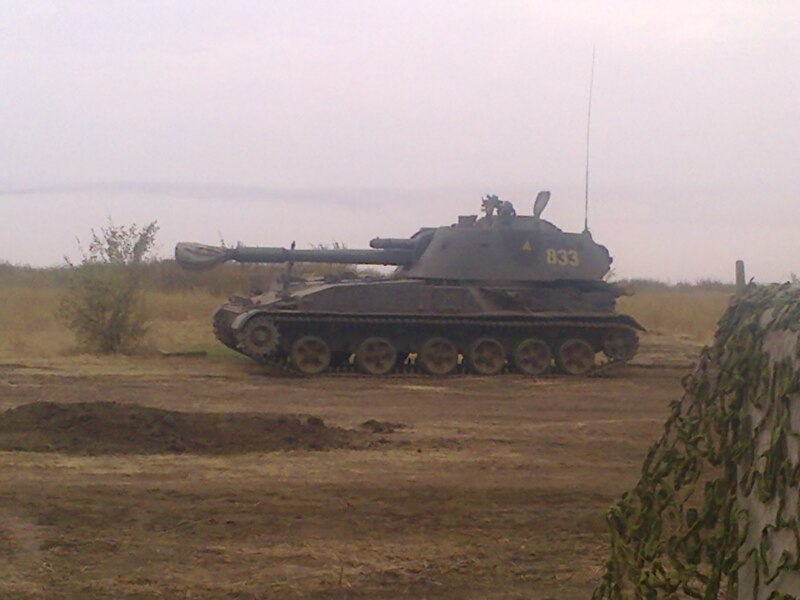 Among the Russian troops who had tanks and were seen in the vicinity of the Luhansk Airport during the battles of Autumn 2014, including the 74th Motorized Infantry Brigade, the 136th Motorized Infantry Brigade, and the 200th Motorized Infantry Brigade, only the 200th used T-72B3 tanks. 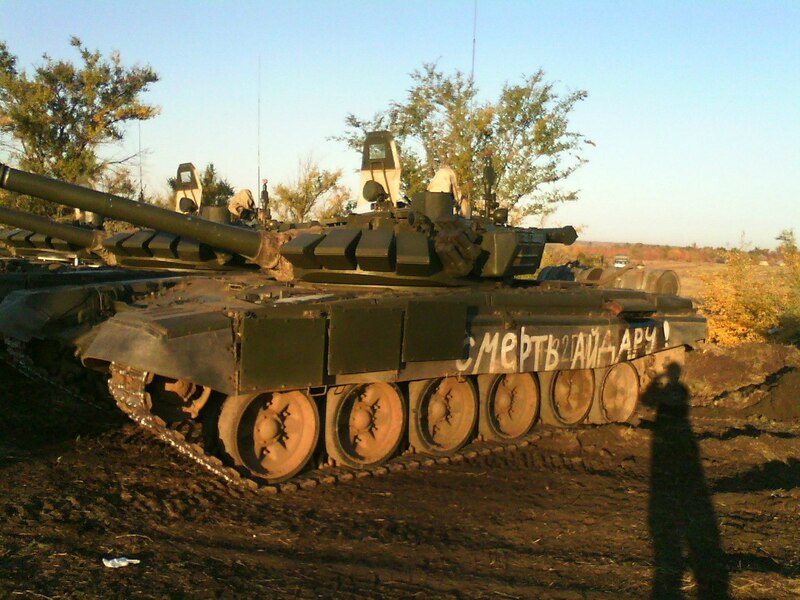 The evidence above gives us grounds to believe that the T-72B3 in the video, as well as the T-72B3 in Kalashnikov’s photograph, belongs to Russia’s 200th Motorized Infantry Brigade. 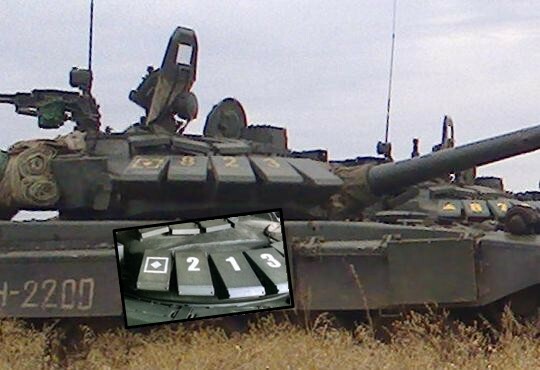 The yellow triangles and temporary hull numbers painted onto the 200th Brigade’s armored vehicles in Ukraine. 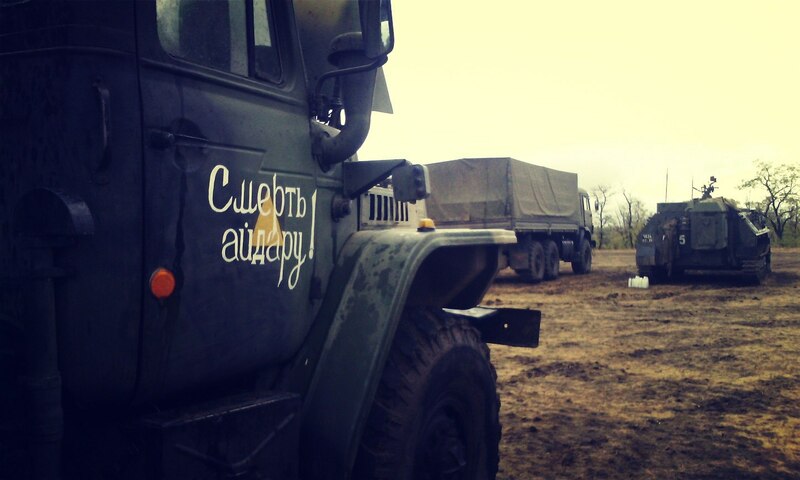 Non-regulation inscriptions on military equipment in the form of propaganda slogans for World War II, phrases with reference to the Donbass, LNR, DNR, the Aidar Battalion, and so on (many similar images have been found by the blogger-investigator Irakli Komazidze on the VK pages of Nikolai Dugaev and Mikhail Boyurov). Photographs of soldiers with details that are specific to war zones, such as being in military uniforms without insignia, wearing civilian clothes and/or shoes, wearing white identification arm and leg bands, rubber bands on the butts of small arms, and insulating tape on clips. The awarding of military distinctions to servicemen. 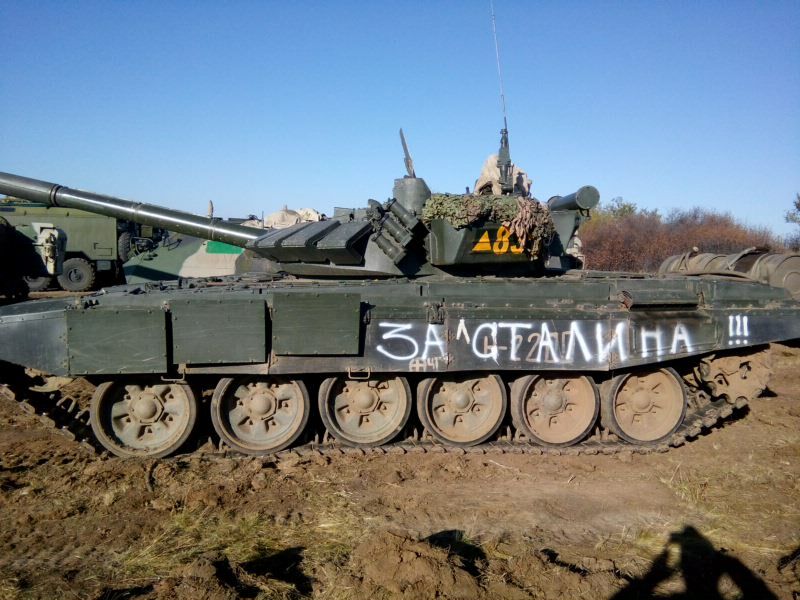 The first two points will be explored in this post — the military equipment photographed in the Donbass, on the border, and back at the base of the 200th Brigade in the Murmansk Oblast, bearing yellow triangles, propaganda slogans, and sometimes identical marks on the same equipment in both the Donbass and Murmansk Oblast. The last three points are explored in the conclusion to this series, found here. 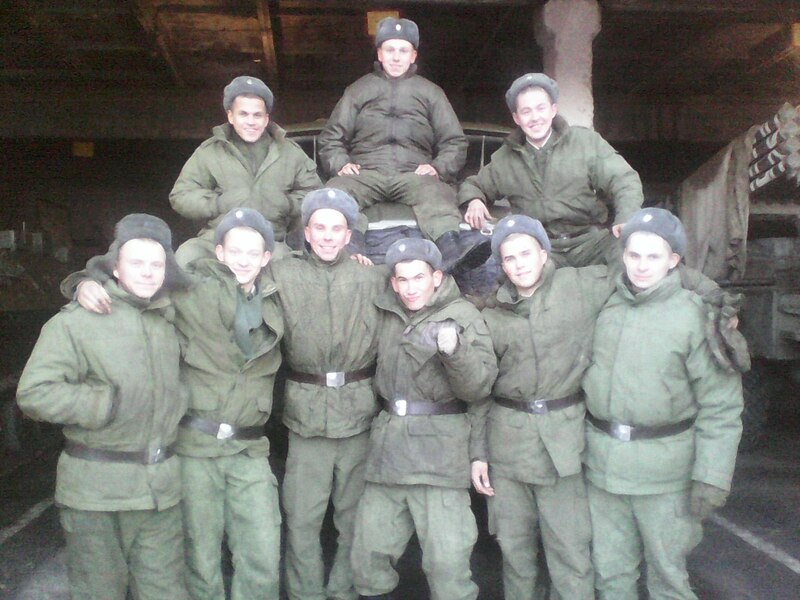 Photograph of servicemen of the 200th Brigade with many features typical of combatants in the Donbass. 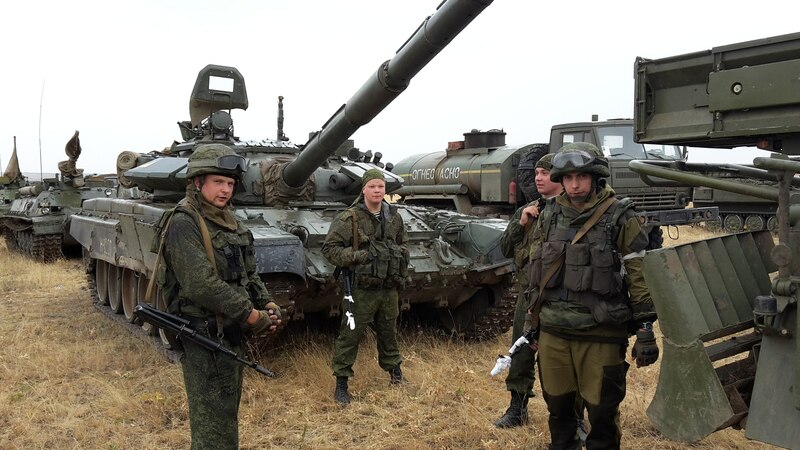 As described in a previous investigation, the military equipment of Russia’s 200th Motorized Infantry Brigade carried yellow numbers that were either in the 700 or 800 range, instead of the old white numbers. In some cases, the old, white numbers were painted over with the new, yellow ones. The first part of this investigation provided photographs of seventeen MT-LB BMK armored transporters with the tell-tale yellow hull numbers. 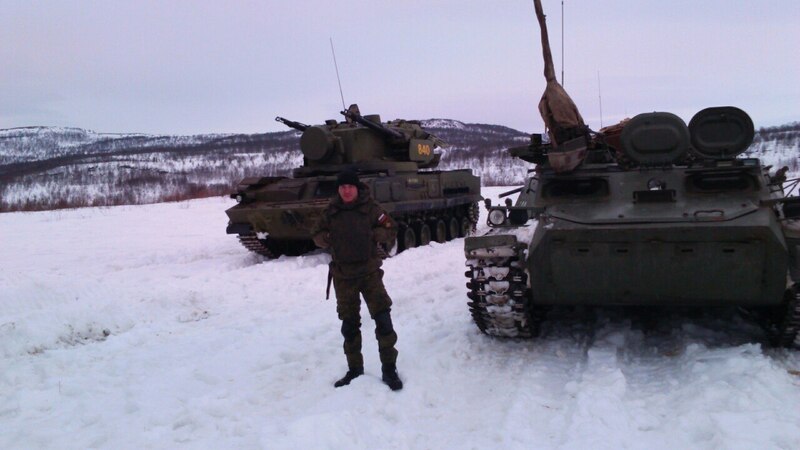 Other than the MT-LB BMK, other armored equipment of the 200th Brigade received such yellow numbers: T-72B3 tanks, 2S3 Akatsiya self-propelled artillery, and the self-propelled anti-aircraft system 2S6 Tunguska. 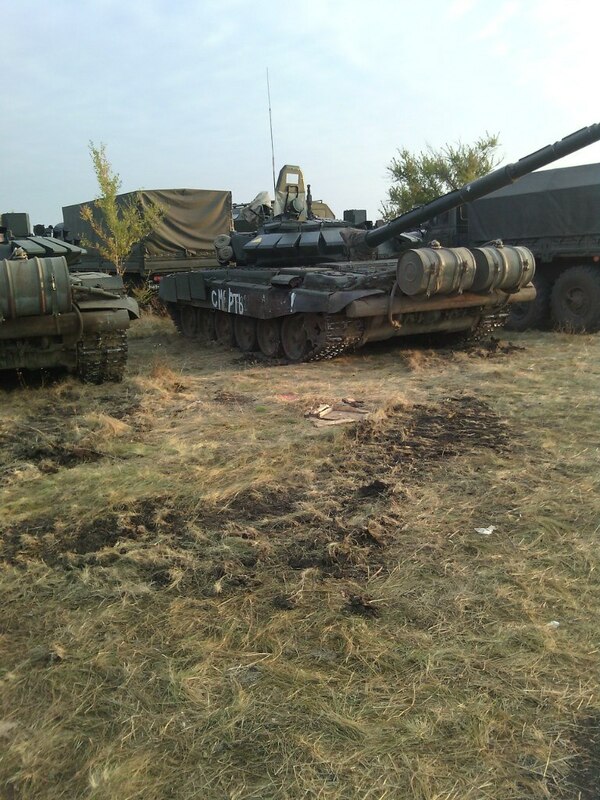 Collection of equipment from the 200th Brigade with yellow numbers, including T-72B3 tanks, 2S3 Akatsiya, and 2S6 Tunguska. 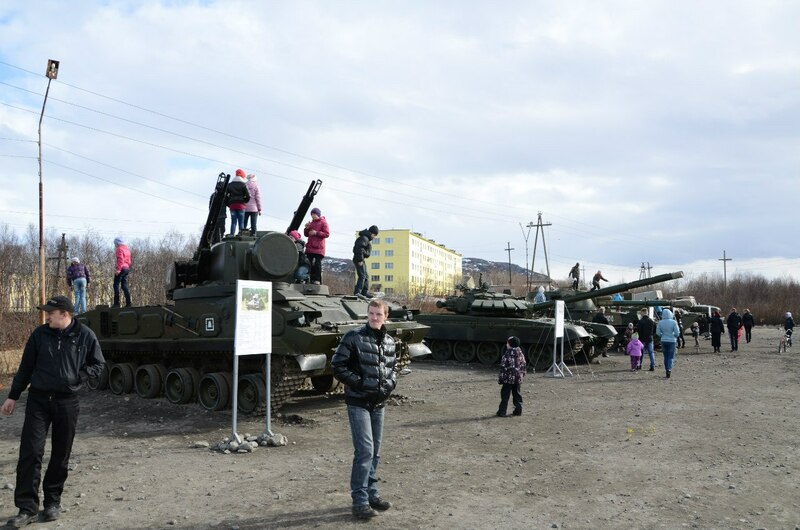 This “Motherland” tank can be seen below after returning to its permanent location at the 200th Brigade’s base back in Russia. White paint has been newly applied with a traditional number that starts with 200; however, the “For the Motherland!! !” inscription is only partially erased. 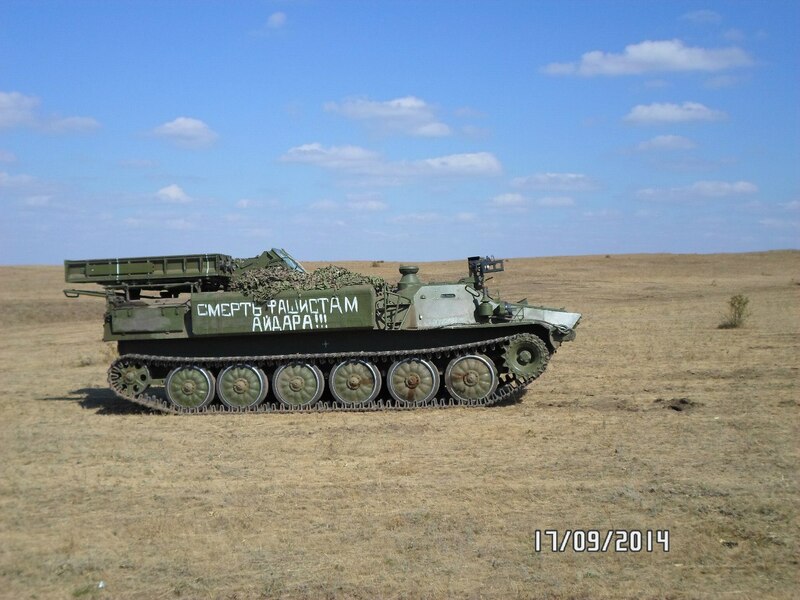 An analysis of accounts from Russian servicemen on VK allows us to find pictures of some of these tanks, self-propelled guns, and anti-aircraft complexes. 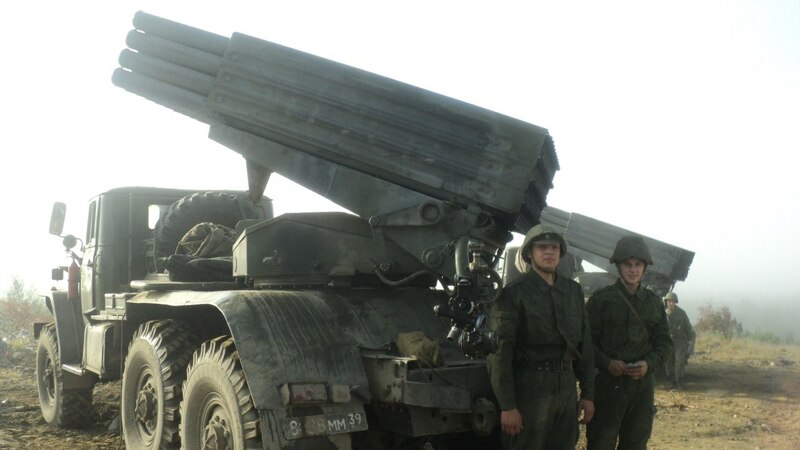 The following list will provide this information: the yellow number of the military equipment, an archived copy of the VK page (if available) where the photograph was found, and a link to the original photograph on the VK servers. 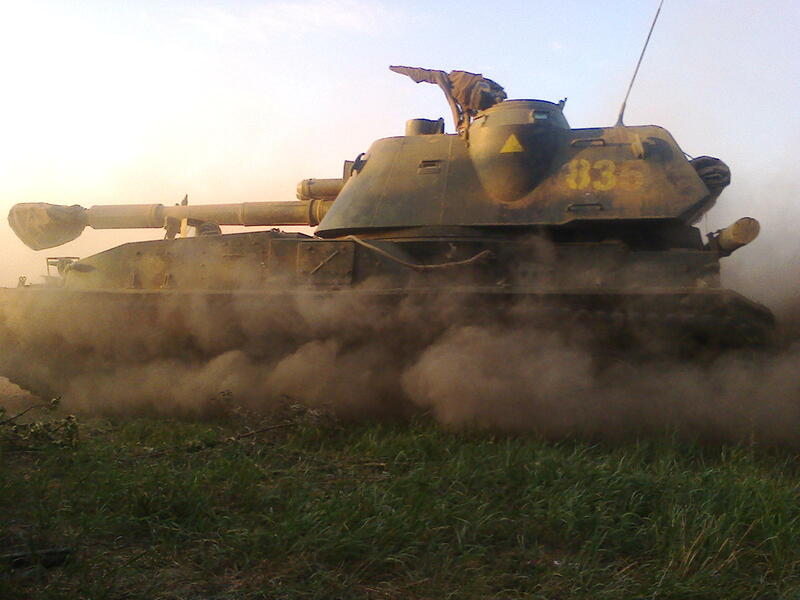 T-72B3 tank numbered 831 with “For Stalin!” on the left side. 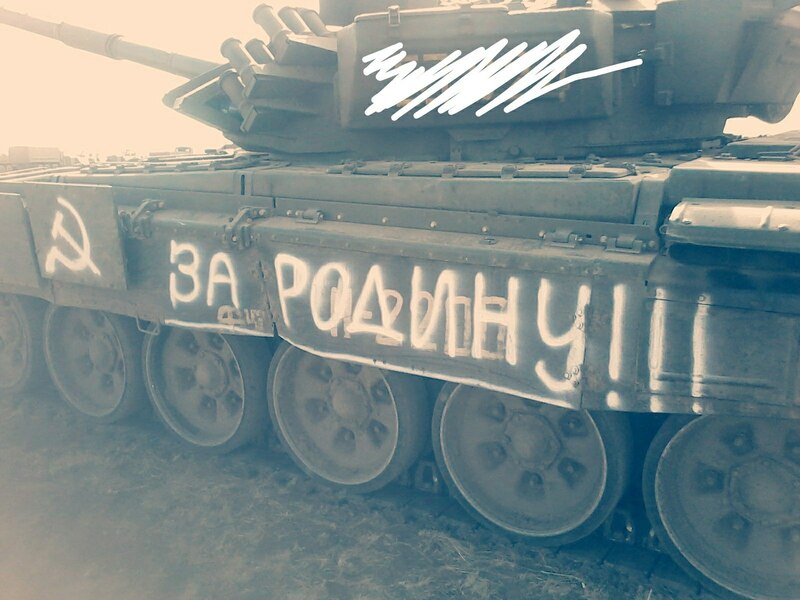 T-72B3 tank without a number, with the inscription “Death to Aidar” on both sides. 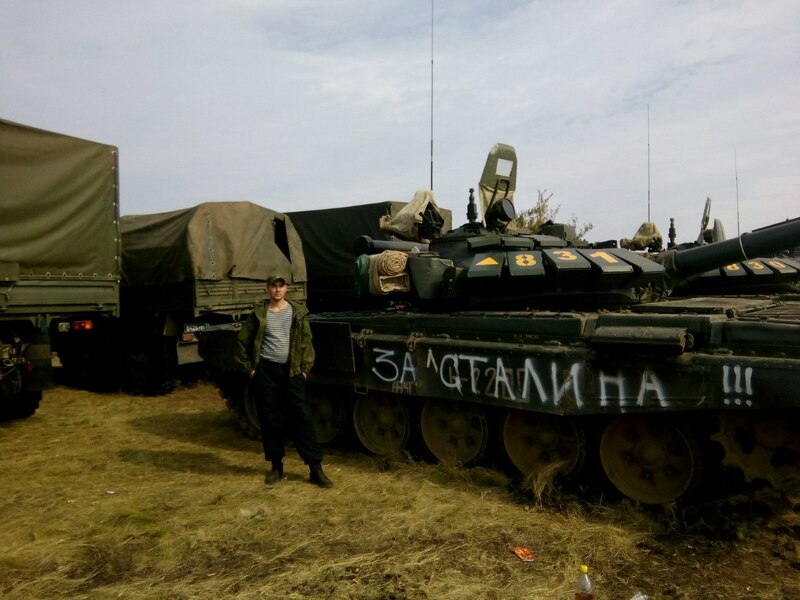 Self-propelled artillery 2S3 Akatsiya with the number 834 and the inscriptions: “Stalin’s Fist” on the barrel, “Don’t make a noise or I’ll come for you” on the right side, “Death to Fascism” and a yellow triangle on the left side. 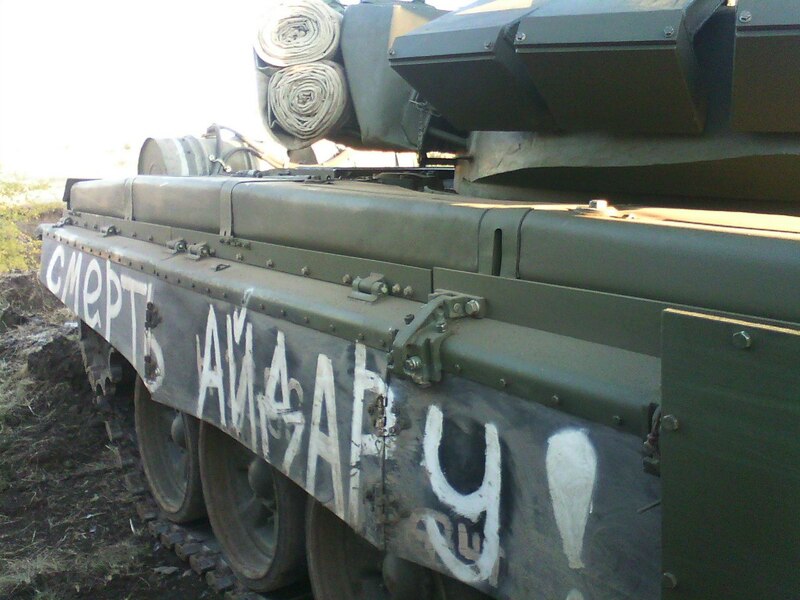 This example is notable for the fact that the tactical sign of the anti-aircraft missile and artillery battalion of the 200th Brigade was not completely erased/written over on the body of the vehicle. 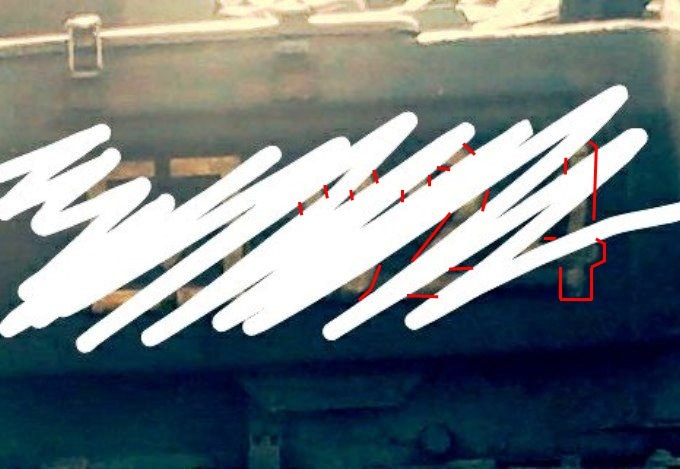 This very same tactical mark can be seen on a Tunguska on Victory Day 2013 (May 9) in Pechenga, located at 69°32’50.7″N 31°12’41.6″E. 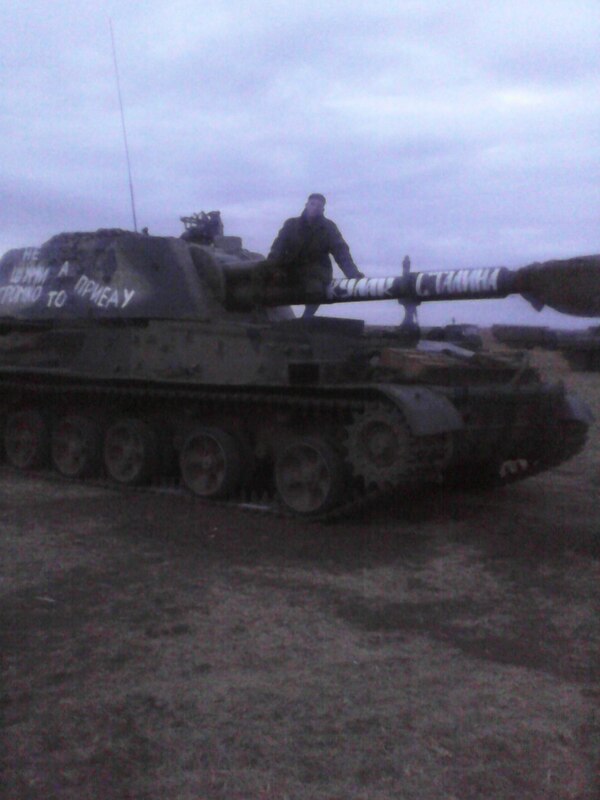 If you doubt the fact that this photograph was actually taken in the small town of Penchenga — one of the homes of the 200th Motorized Infantry Brigade — then the following geolocation will prove the assertion. 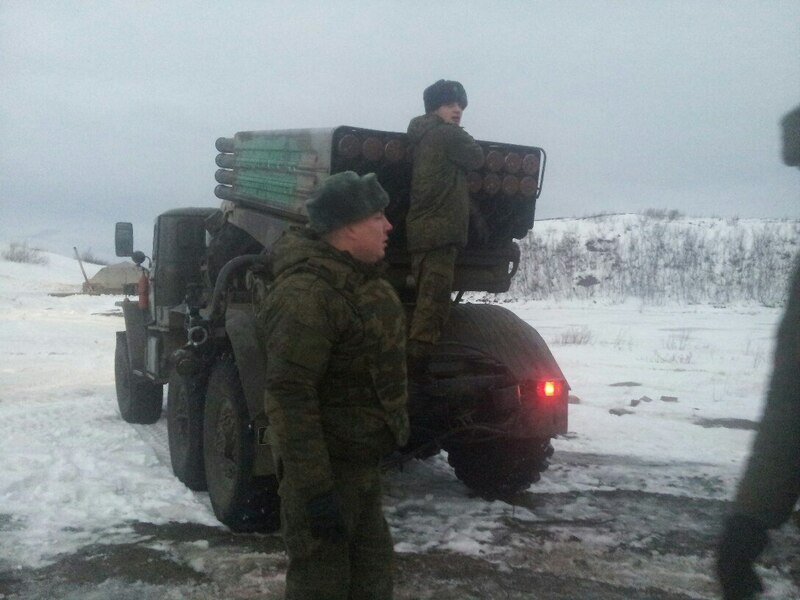 In contrast with the previous examples, the “Strela-10” anti-aircraft missile complex, MLRS BM-21 Grad, and army trucks of the 200th Brigade do not have yellow numbers. 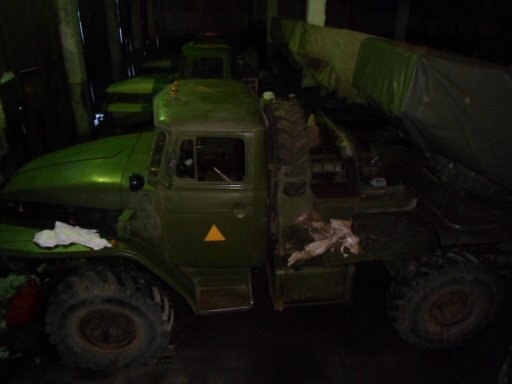 The Grads and trucks were originally without any numbers, and the numbers on the brigade’s Strela-10 complexes were painted over, but not with yellow. 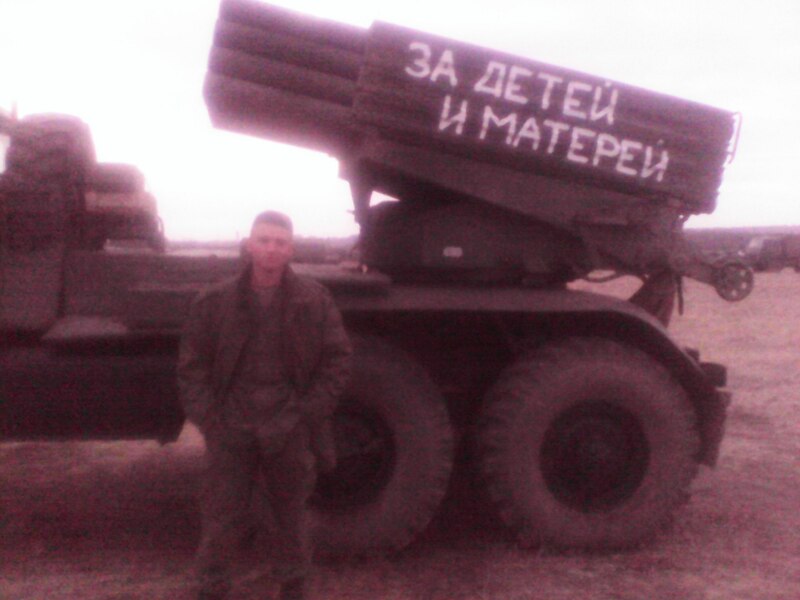 At the same time, we often see propaganda phrases on the Grads and Strelas in the LNR, DNR, Aidar Battalion, and so on. In some instances, there are even yellow equilateral triangles. 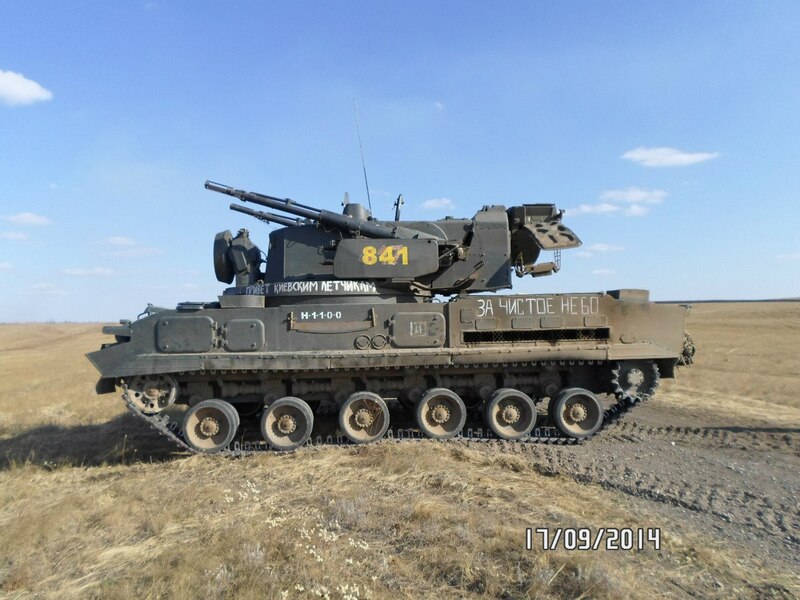 Given that on some of the military equipment there are no yellow triangles or hull numbers of the 200th Brigade, the next section of this post will include a series of photographs along with a brief explanation for the direct or indirect connection with the source image from the 200th Brigade. 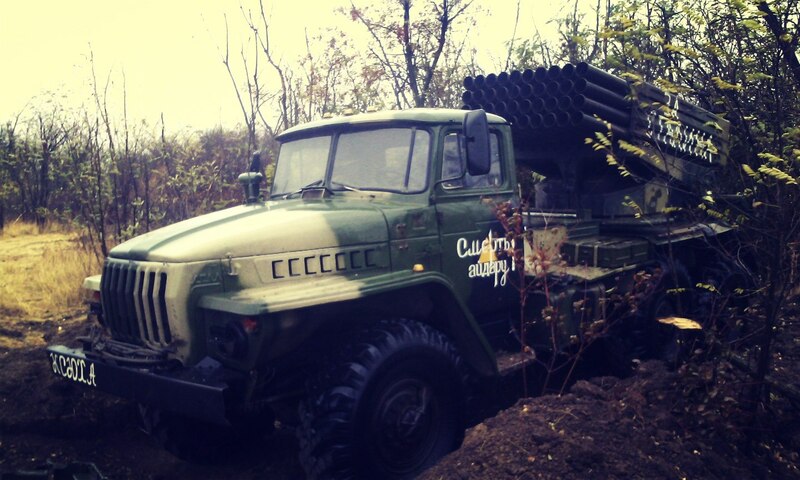 MLRS BM-21 Grad with “For the Motherland!” on the right door and “Antonina Ivanovna” on the front bumper. 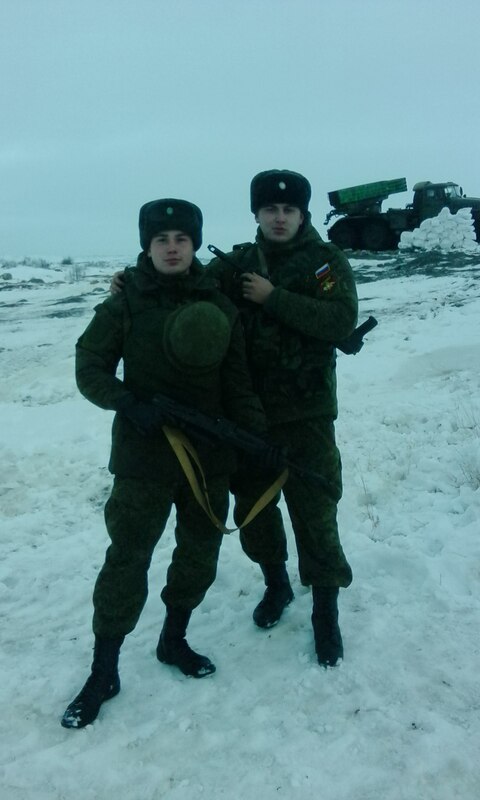 The photographs are Russian servicemen of the 200th Brigade, Anatoly Gorshkov (who was serving at that time) and Nikolay Dugaev. 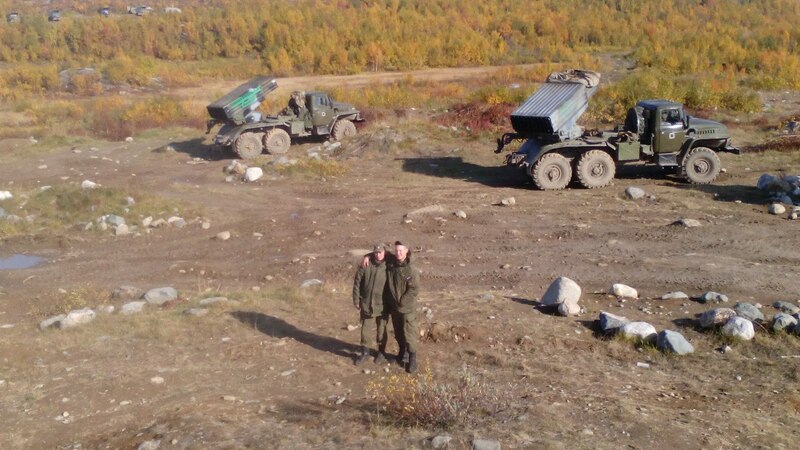 There are archives (1, 2) of Gorshkov’s VK pages with a report on his dismissal from the reactive artillery battalion of the 200th Brigade, and a photograph with a geotag from Pechenga). 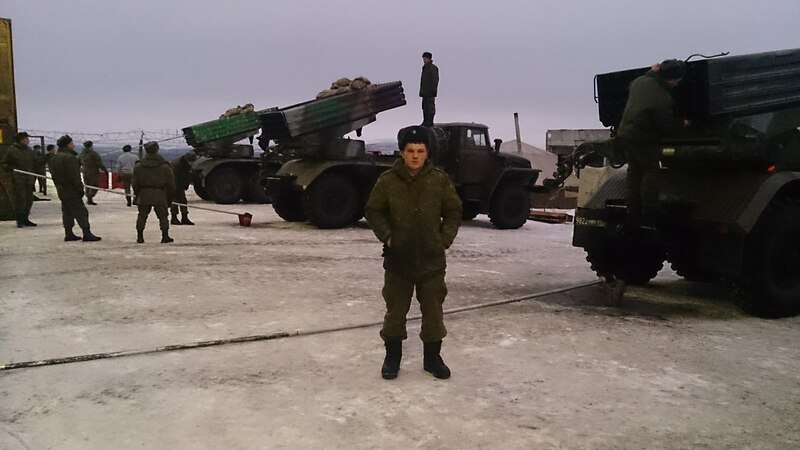 Two different MLRS BM-21 Grads with identical “Death to fascists” phrases on the right side. The photographs are from the aforementioned Nikolai Dugaev. 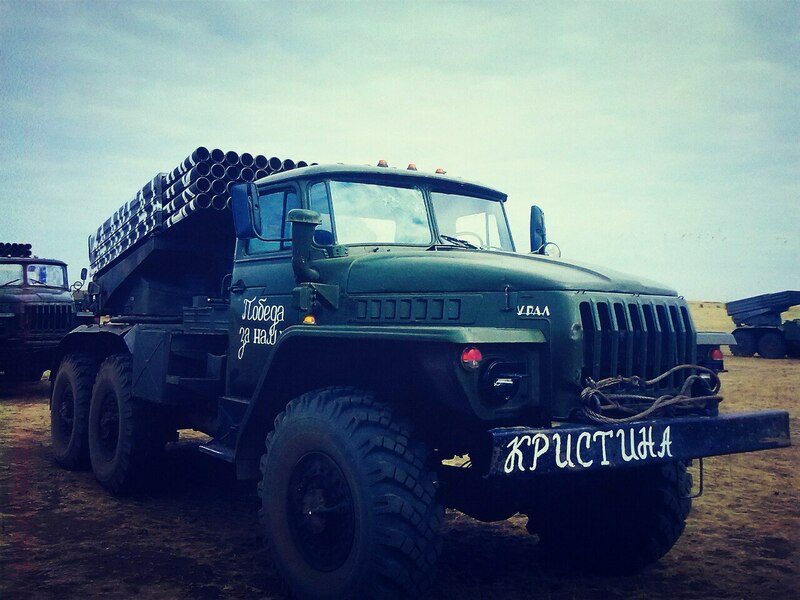 MLRS BM-21 Grad with the phrase “Victory is ours” on the right door, “Kristina” on the front bumper, “For Luhansk” on the right side of the missile launcher (photographs from Aleksandr Morshansky and Nikolai Dugaev). 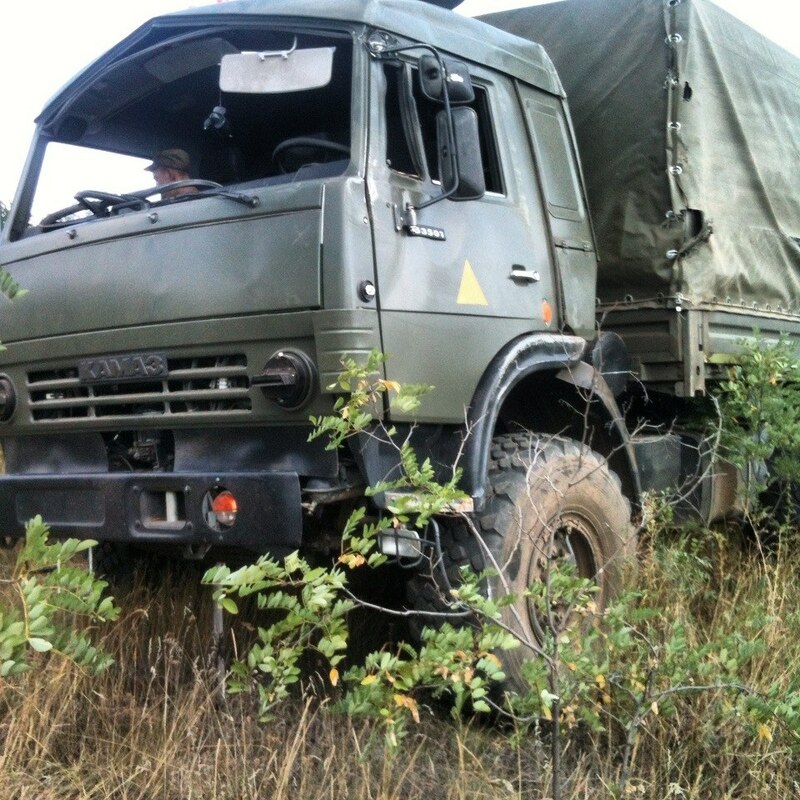 The previous photograph was uploaded by Yevgeny Anuchny, a Russian serviceman. 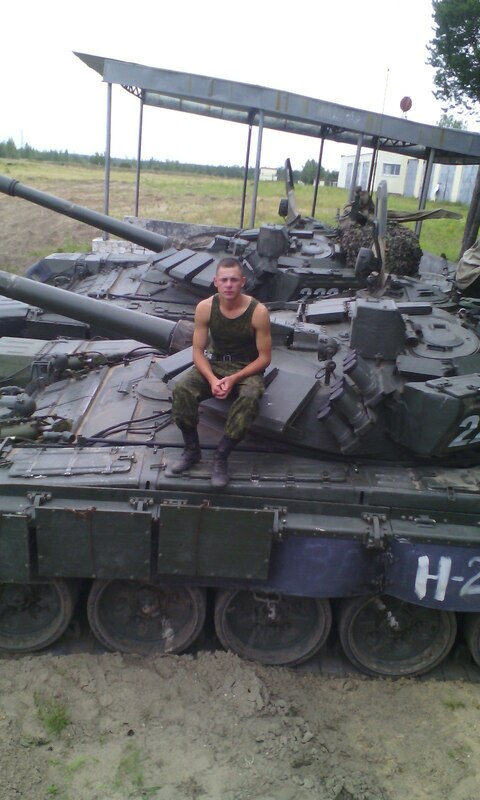 The last picture from his account shows a local newspaper where it is printed that he serves in the 200th Separate Motorized Infantry Brigade. 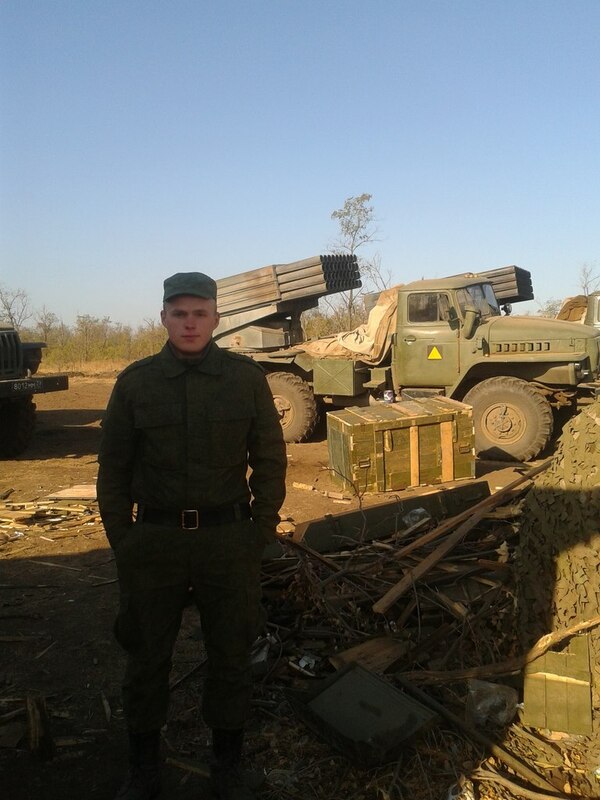 There is also an archived page from Anuchny’s account where there is a photograph with a geotag from Pechenga, the location of the 200th Brigade. 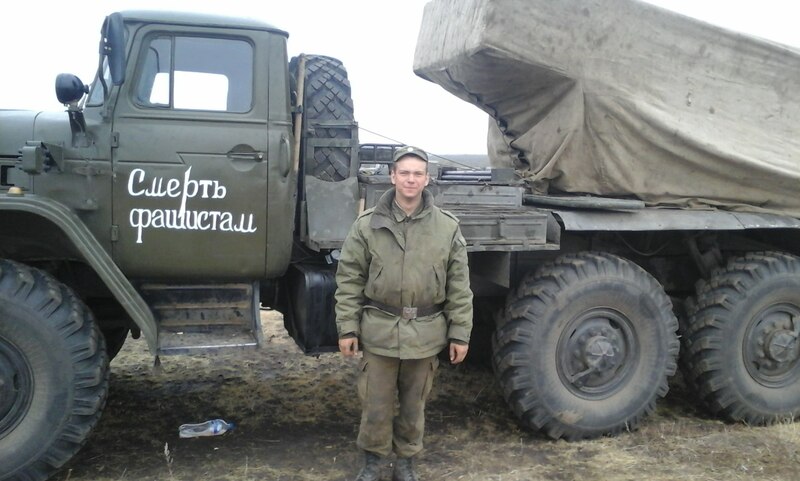 There is little doubt that he is/was truly a serving member of Russia’s 200th Motorized Infantry Brigade. 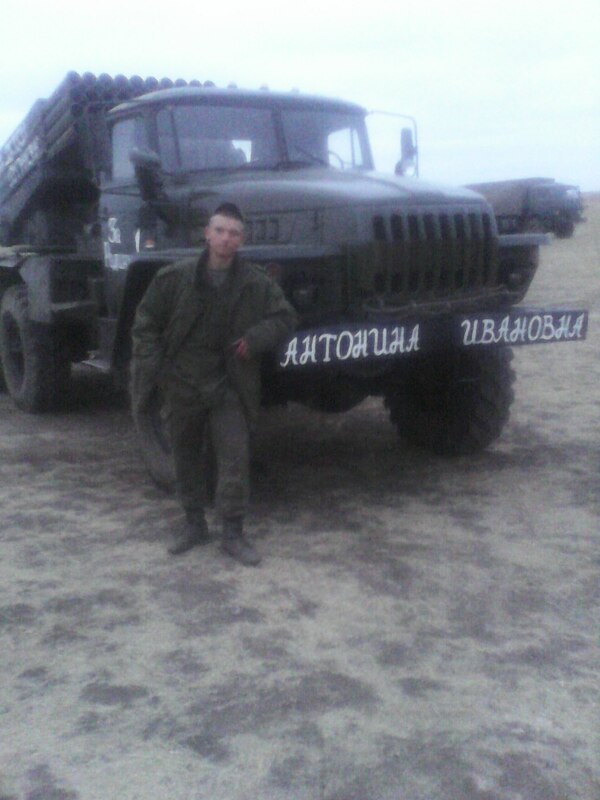 There are even more photographs from the social media accounts of 200th Brigade soldiers showing Grads with painted-over missile launchers. 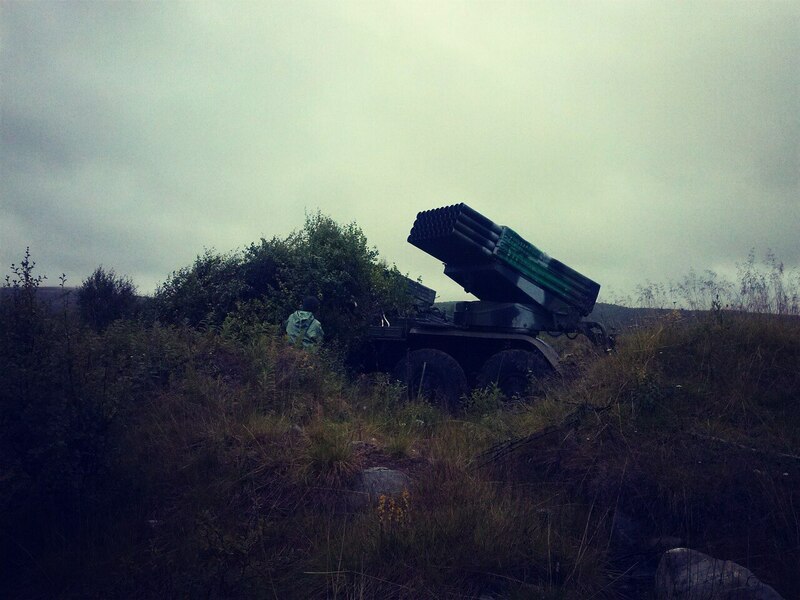 A photograph of one of the damaged Grads in February 2015 was published by the information agency of Murmansk and Murmansk Oblast “SeverPost.ru.” On the left side of the missile launcher, we can see the phrase “Children of Donetsk” (apparently, the full phrase was “For the Children of Donetsk”). 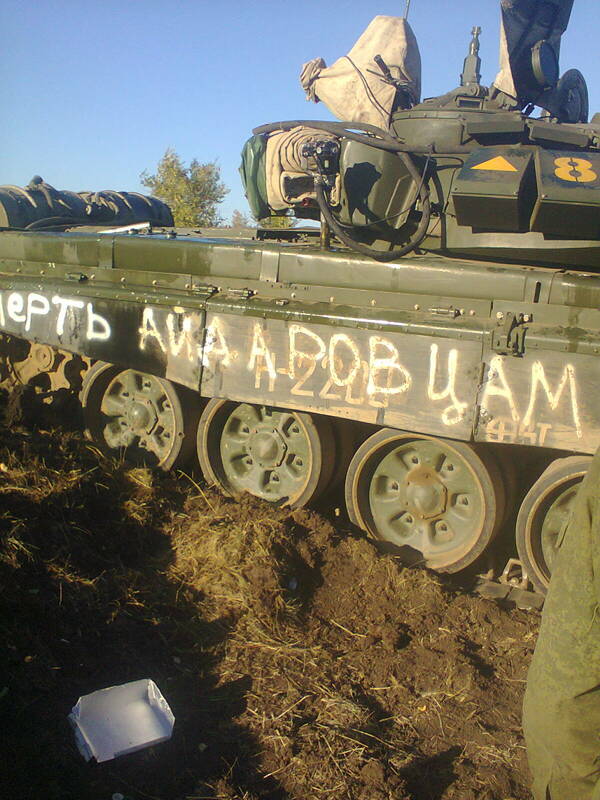 The remainders of the phrase “Children of Donetsk” on a Grad from the 200th Brigade. 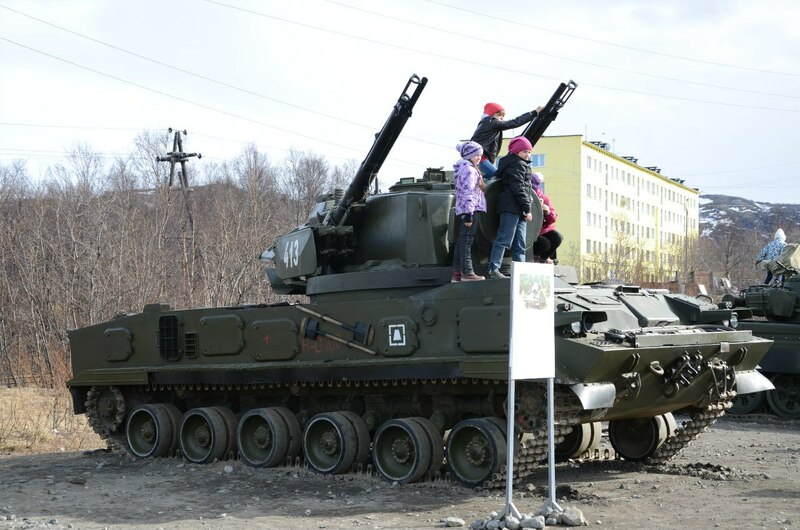 With the help of Google Street View, we can establish that this photograph was indeed taken in the Murmansk Oblast, in the city of Kola. The photograph was taken at 68°52’58.3″N 33°02’22.5″E on Privokalnaya street at the cafe “Retro,” near the railroad. Left: Part of cafe “Retro” on the photograph of the Grad. Right: Cafe “Retro” on Google Street View. 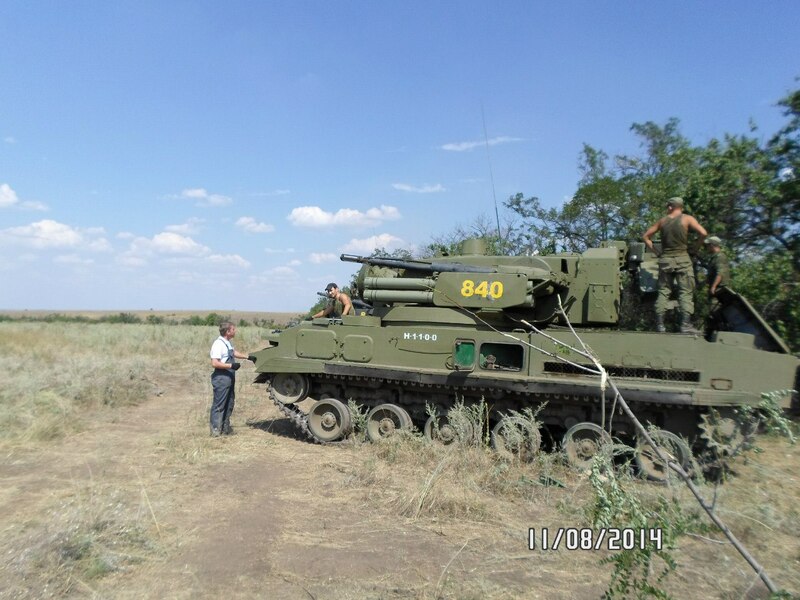 Among the photographs uploaded by Nikolai Dugaev (he deleted his VK account, but then later restored it, but without his most compromising pictures under the name Anatoly Grachev), serviceman of Russia’s 200th Motorized Infantry Brigade, are those showing military equipment, such as a RHM-6 reconnaissance chemical machine (in the foreground) and broadcasting station R-166-0.5 (just behind the RHM-6). 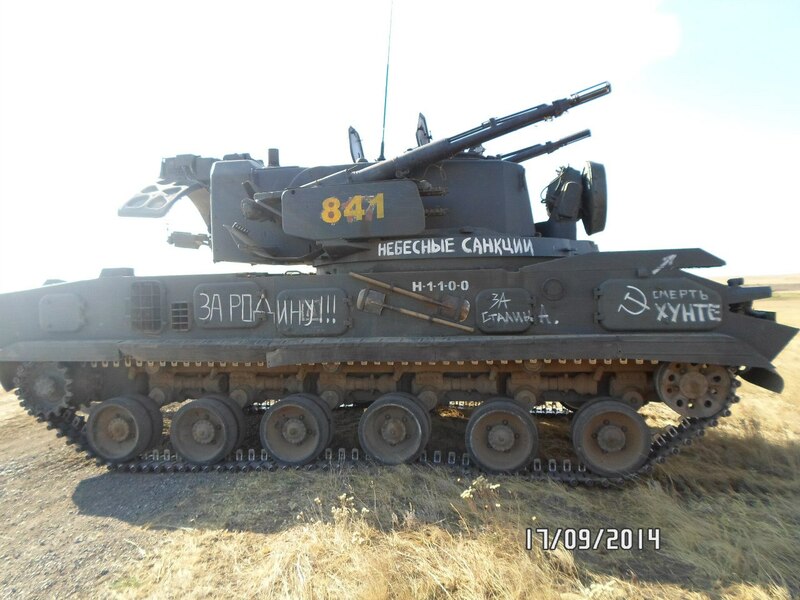 On these, are also see the tell-tale writings and graffiti that is so often seen in the Donbass. 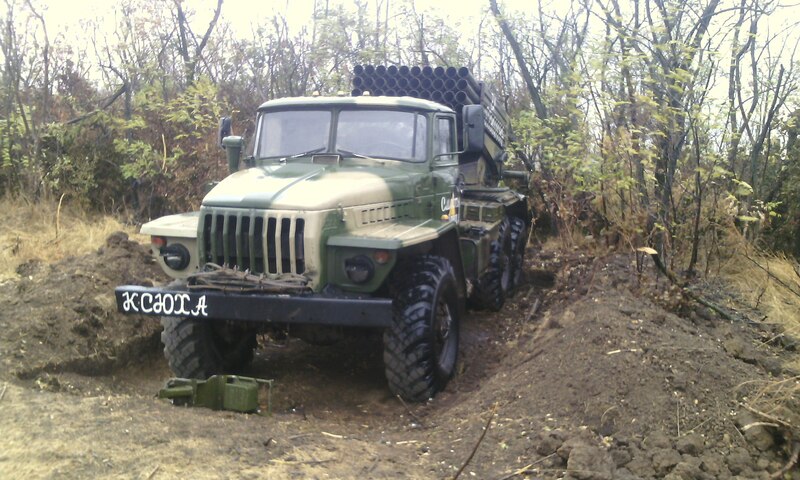 Photograph from the account of Nikolai Dugaev, showing military equipment with covered up markings on the side. The equipment hoists the Russian naval ensign and naval jack. This is not the same as the flag of Novorossiya. 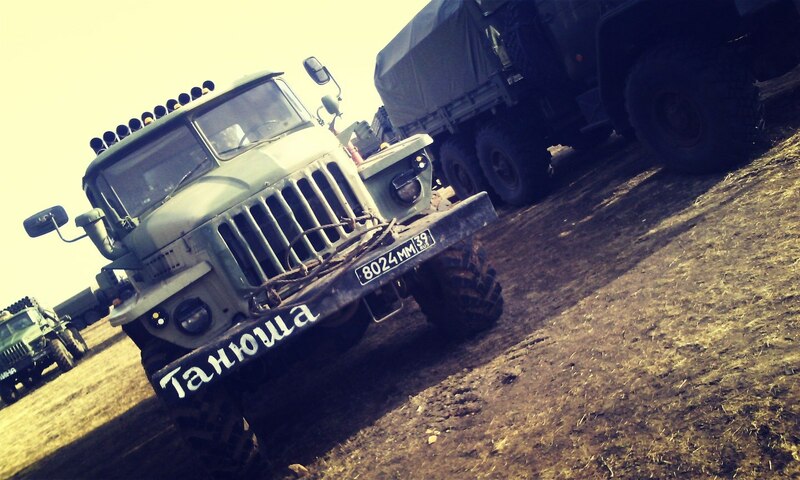 Military equipment with the phrase “Donetsk” on the side, along with “USSR” and a Soviet hammer and sickle. 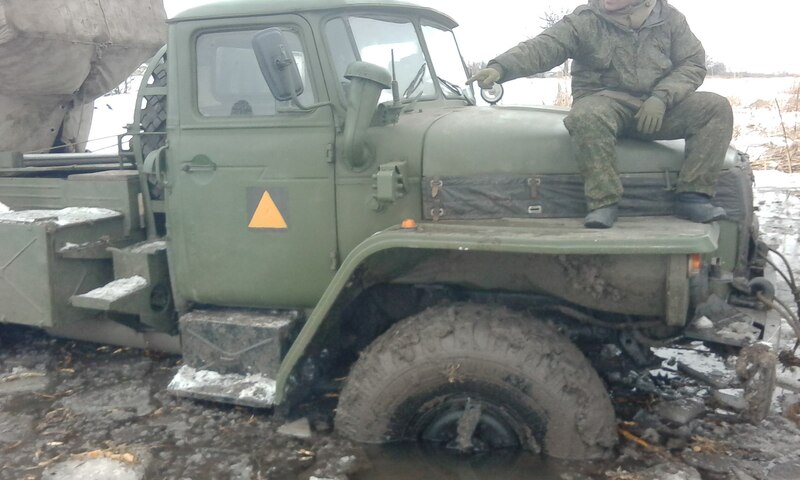 Finally, there are three examples showing army trucks in the 200th Brigade that show the yellow triangles that are so often seen in the Donbass. The remainder of the article can be found here. It needs to bring peace and prosperity somehow to the Middle East so they didn’t even think about Jihad. Political-technology, mechanical approach, spiritless – is there such term? … Propaganda factory, based on scientifically developed manipulative methodics, applied technically, I meant that. You’ve just hit the nail on its head…. Oops, ‘Spiritless’ = ‘weak’ is a wrong word. In Russian it means more like ‘without spirit/good intentions/fair idea’, mechanical. Putin and the Night Wolves vs. Poland. by Masha Gessen. Thanks for your investigations, billingcat! It’s a pity that tramps of the New World do not believe you. Strange play, isn’t it? Somebody has forgotten to paint the tactical mark before the section with shovels as in original and has painted it behind the section with the shovels instead.